Whenever the Lockport Library has an author come to speak, I try to read the books (if I haven’t already) by the author who will be visiting. I want to be familiar with their works for any questions I may have when I go to the event. This year’s “One Book, One Community” will feature Marie Benedict, author of The Other Einstein. This novel is Benedict’s debut work. She will be at the Lockport Library, Tuesday, October 24th at 6:30PM. Mileva “Mitza” Maric is a woman who is just a little bit different than most of her peers in the last years of the nineteenth century. At twenty years old and unmarried, she is viewed as a spinster and a little bit strange because of her deep interest in mathematics and physics. She is one of only a handful of women attending university in Zurich, and the only one competing in physics against male students. It is in this physics class that she meets Albert Einstein. Mitka, used to breaking many of the conventions of the day, she begins a relationship with Einstein, albeit mostly innocent at first. 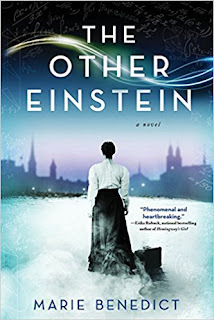 Einstein kindly barges his way into her personal life when he invites himself to her boarding house to accompany the girls who live there on his fiddle. Eventually, the spark between Mitza and Einstein grows into a much larger flame. Maric and Einstein worked in tandem as they set out to make a name for themselves in the world of physics. When she became pregnant, Einstein forged ahead with their theories while she raised the children. Even though they worked together and developed theories together, Albert took more and more of the credit. Both Einstein and Maric suffer from the same affliction that seems to come with being a genius. They sometimes are extremely socially awkward, Einstein more so than Maric. Benedict was able to bring this out through her prose. Einstein was brisk in his manners which came through the writing. Likewise, Maric sometimes has difficulties developing relationships with others. Once she finds a friend, though, she was dedicated to that person. Benedict shows the struggle that Maric had to go through to achieve recognition in a time when women were expected to be wives who kept their opinions to themselves. Attending Zurich Polytechnic was completely out of the norm. The reaction she got from the male staff and male students was less than favorable at the beginning of her tenure as a student. This continued into her post academic life. As Albert’s wife, Benedict shows them working together on some of Einstein’s early work, but it was rather easy for Albert to omit her name from the submitted papers. As this repeatedly happened, their relationship broke down. Add to this, Albert’s infatuation with his cousin, Elsa Lowenthal, and a terrible division occurred between them. Maric then had to raise her children as a single, divorced woman in a time that it was greatly frowned upon. Benedict details all these struggles. There were points while reading this book that I got angry with Albert Einstein. He had an equal with whom he could discuss his theories, and he disregarded in public the assistance she provided. There were also parts where Maric made me similarly mad. Her social skills of the period made her quite unlikable at times. I think it behooves us to remember that this is historical fiction. There is no proof that Maric had any input on Einstein’s works. While there has been much debate on the subject, there has been nothing conclusive. What Benedict did, and which I think is brilliant, is take that one little thread and weave it into a tapestry of “what-if.” There is so much potential for making these distant people seem real. The result is a renewed interest in both Albert Einstein and Mileva Maric. It also gives us an opportunity to look at the plight of women at the dawn of the 20th century. I enjoyed reading this book. I like history and often think about how life was for people like the Einsteins before they were famous and still struggling. I found myself referring to websites about the lives of both these people while I was reading the novel. It had me looking for books on either of them so that I could continue learning about them. Isn’t that part of what a great book should do? Craig Bacon is no Einstein, but he knows good books when he reads them. Someday, when they write his story, he hopes the author makes him taller with better hair.